Election Update: What If Clinton Wins North Carolina — And Loses Pennsylvania? Donald Trump continues to make modest gains in the FiveThirtyEight forecast. His chances are 21 percent in our polls-only model and 23 percent in polls-plus, his best position since early this month in each forecast. And Trump has narrowed Hillary Clinton’s popular vote lead to roughly 5 percentage points from 7 points two weeks ago. But there’s not yet much evidence about what impact, if any, FBI director James Comey’s letter to Congress on Friday about Clinton’s personal email server will have on the race. Instead, the best polls of the day for Trump were probably a pair of Florida polls completed prior to Comey’s announcement. A poll conducted by Siena College in conjunction with The New York Times’ Upshot blog showed Trump leading Clinton by 4 percentage points — a shift from a 1-point Clinton lead in a Siena/Upshot poll of Florida in September. And a Marist College poll for NBC News and The Wall Street Journal had Clinton with a 1-point lead in Florida, down from a 3-point lead earlier this month. Florida is a well-polled state, and Clinton remains slightly ahead in the polling average there, with a lead of about 1 percentage point overall in our forecast. But Florida is now somewhat less likely to jump its position in the queue and save Clinton if she has last-minute problems elsewhere on the map, such as in Pennsylvania or Michigan. By contrast, two new polls of North Carolina showed Clinton with leads of 3 and 6 points, a problem for Trump given that Clinton has a substantial lead based on early voting in the state. Of the eight state or national polls that conducted at least some interviews on Friday or Saturday, two showed a 1-point shift toward Trump, one showed a 2-point shift toward Clinton, and the other five recorded no change. Of course, that’s not what the headlines behind these polls necessarily said. The IBD/TIPP tracking poll, for instance, claimed Clinton’s lead had shrunk “as email scandal blows up.” But her lead in the poll — 2.5 percentage points — is essentially identical to what it was two days ago (3.0 percentage points) before the Comey news. That’s not to say the news won’t hurt Clinton, however. Absence of evidence is not the same thing as evidence of absence, and without any fully post-Comey polls, there’s just not much data yet on what effect it will have on the race. Clinton also has a variety of potential responses to the FBI news, which could mitigate any potential effects — or worsen them, if she chooses wrongly. But let’s say that the polls continue to shift toward Trump for whatever reason — whether because of Comey or something else. In that case, Clinton’s “firewall” could shift toward states where she’s already banked a lot of votes as a result of early voting. In particular, Clinton’s lead in North Carolina may be harder for Trump to overcome than our model (which doesn’t directly account for early voting) may imply. The same might also be true of Nevada, where Democrats have a clear lead so far based on early voting results, and where Trump will either need a massive Election Day turnout or a great performance among independents to overcome. 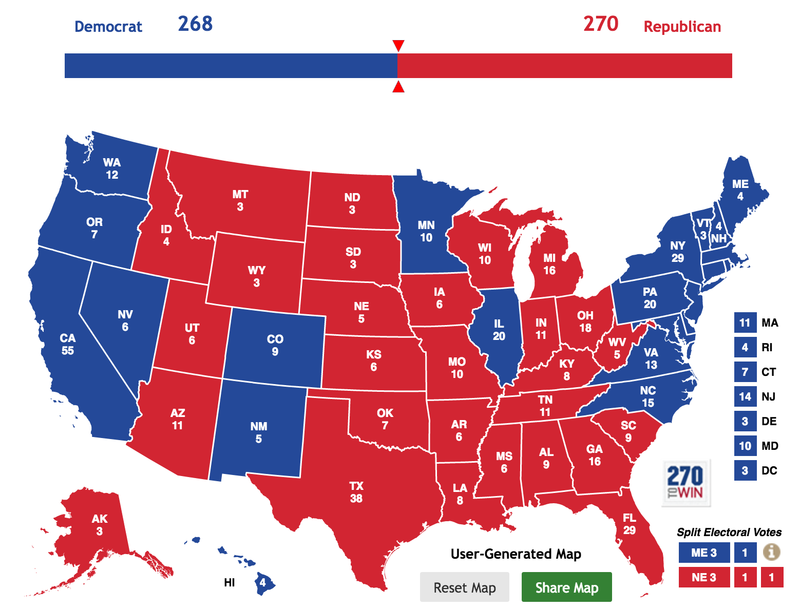 Neither map would leave Trump with much margin for error. Polls have actually shifted away from Trump in Maine’s 2nd District despite his seeming demographic advantages there. Nebraska’s highly-educated 2nd Congressional District — it’s the other state to split its electoral votes by congressional district, along with Maine — could also go to Clinton (there’s been almost no polling there). Utah is a wild-card for Trump because of his poor standing with Mormons and Evan McMullin’s position on the ballot. Even Alaska, where a new poll this weekend actually showed Clinton ahead, is a source of uncertainty. OK, this is getting far into the weeds. Obviously, Trump doesn’t have an easy path forward if he loses North Carolina. The point is really just this: Despite the recent tightening, Clinton has a fairly significant lead in the polls of about 5 percentage points. So in order to win, Trump needs a further shift because of Comey or some other news — or he needs the polls to have been off the mark to begin with. 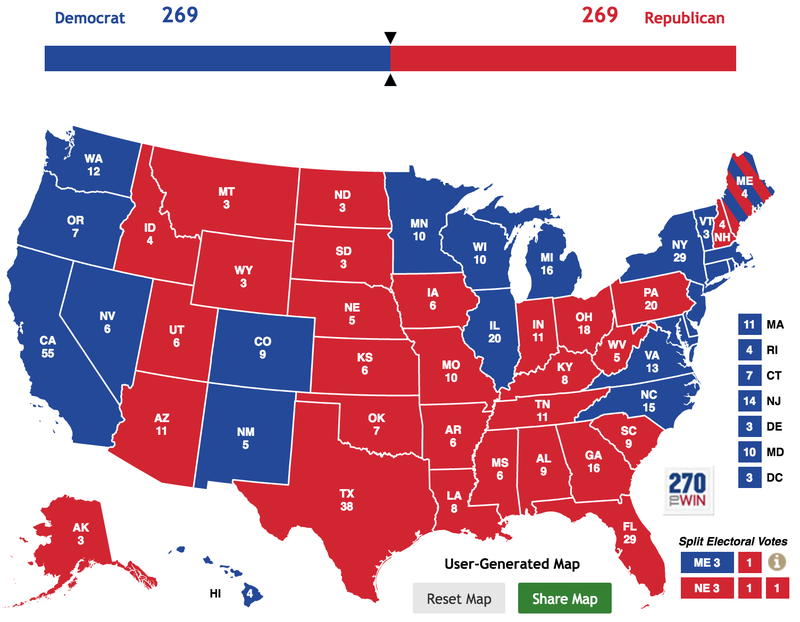 In the event of a last-minute shift or a significant polling error, the order of the swing states could easily be scrambled, such that Clinton wins North Carolina while losing Pennsylvania or Michigan, for example. With the race in a somewhat dynamic state as we enter the final full week of the campaign, we encourage you to think broadly about how the Electoral College might play out instead of fixating on just a few scenarios. Technically, the incoming 115th House would determine the president in the event of an Electoral College deadlock — not the outgoing one — but Republicans are likely to control the majority of congressional delegations if Democrats’ performance has deteriorated to the point that they’re losing states like Pennsylvania.